In 1930s New York City, private detective Charlie Doherty is weathering the Depression just fine. Bankrolled by a wealthy man whose son he rescued and whose sole condition is priority access to any records and photos, he enjoys a comfortable apartment, an elegant wardrobe, and a brimming bank account. Doherty's latest client, Mrs. Fairfax, wants him to prove that her husband's recent death was not suicide. 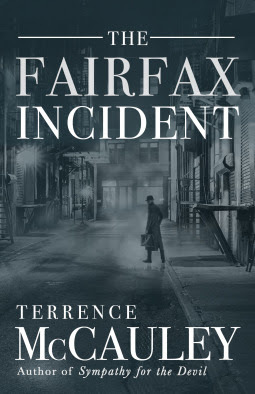 Early one morning, Walter Fairfax, head of a successful insurance company, entered his office, sat at his desk, took a phone call and shot himself in the head. Just when former Marine and ex-cop Charlie Doherty thought he'd left the horrors of war behind him, this seemingly open-and-shut case revives painful memories and could turn out to have global consequences. Told by Doherty himself in what could be the voiceover for an old-fashioned detective movie, this suspenseful story deals with façades and what hides behind them. I truly enjoyed the unexpected complexity of the plot and the tension that the author maintained throughout this novel. The style of the narrative was perfect, Doherty's wisecracks punctuating his account with welcome touches of humour like flashes of lightning in the dark, broody atmosphere. I was provided with a free electronic copy of this book through NetGalley by the publisher, Polis Books, in exchange for an honest review.